This Computer training facility features metal laminate cabinets with custom maple pulls. 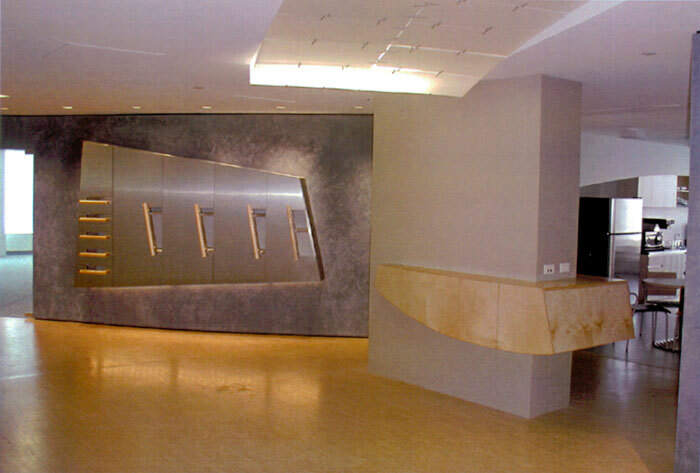 The curiously shaped cabinets penetrate the serpentine wall, and are accessible from both sides. The maple credenza has a curved bottom and the pantry cabinets a curved top. Founded by an immigrant craftsman from Italy and still family owned, Premier Wood Concepts uses it's vast knowledge of the woodworking art and business to help ideas take shape into finely crafted pieces, built for years of enjoyment and beauty. Combining modern methods, tradition, and the finest materials available, we can assure you and your clients that our work will stand up to the closest scrutiny, by the most demanding industry standards.